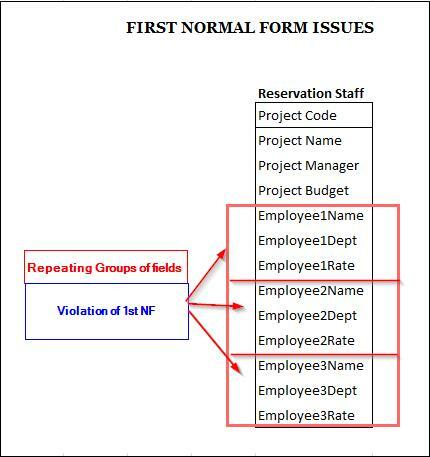 Normalization is a set of rules that are to be applied while designing the database tables which are to be connected with each other by relationships. Database normalization is a technical term to improve the data accuracy and efficiency and reduces the data redundancy and inconsistent data dependency. For the examples, we’ll use table Reservation Staff Information as shown below UNF as a starting point. As we pointed out in the last post’s modification anomalies section, there are several issues to keeping the information in this form. By normalizing the data you see we’ll eliminate duplicate data as well as modification anomalies. 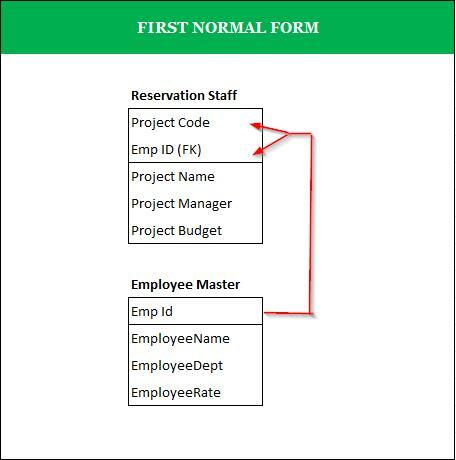 1) Separate the repeating fields into new database tables along with the key from unnormalized database table. 2) The primary key of new database tables may be a composite key. When a value is atomic, the values cannot be further subdivided. For example, the value “Reservation” is atomic; whereas “Reservation; Attendance; Human Resources” is not. Related to this requirement is the concept that a table should not contain repeating groups of columns such as Employee1, Employee2 and Employee3. 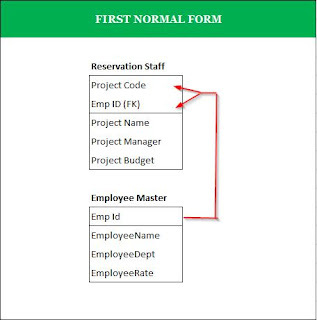 The repeating groups of columns now become separate rows in the Reservation Staff table linked by the Emp ID foreign key. As we know that a foreign key is a value which matches back to another table’s primary key. In our case, the Reservation Staff table contains the corresponding Emp Id for the Employee Master now. 1. The original design limited each Reservation Staff entry to three employees. In the new design, the number of employees associated to each design is practically unlimited. 2. It was nearly impossible to Sort the original data by Reservation Staff. You could, if you used the UNION statement, but it would be cumbersome. Now, it is simple to sort customers. 3. The same holds true for filtering on the Reservation Staff table. Modification anomalies remain in both tables, but these are fixed once we reorganize them as 2nd normal form.